Who’da thunk it would be this fun making bias tape? Please note that I bought the Clover Bias Tape Maker on my own and they don’t even know that I have their product, let alone that I liked it. I don’t remember if I read about the giz-watchy in Threads Magazine or if I just saw it at one of my favorite fabric stores, but I finally bought the one that makes 1/2-inch bias tape. I was tempted to go nuts and buy all the different sizes, but for once prudence won out, and I bought the one to try first. 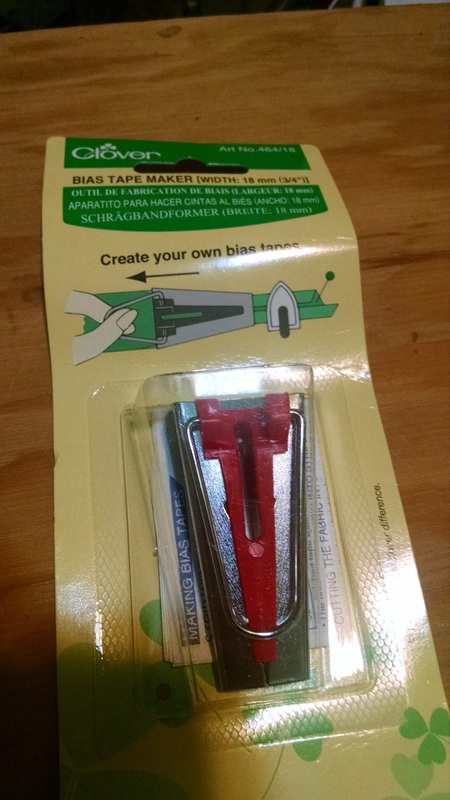 Which is kind of interesting, because the purchase coincided with a slight problem I was having that has absolutely nothing to do with bias tape. While playing around, looking for sites that showed how to make clothing from the 1920s, I stumbled onto DressmakingResearch.com, and specifically, a page showing instructions from 1924 on how to drape a dress. Now, for those of you who don’t know, most clothes are made from paper patterns that you use to cut out the individual pieces of a dress or pair of pants, then sew together. One of the ways designers use to get that pattern is they drape fabric on a person or dressmaker’s dummy, then cut away what they don’t want. This is called draping. And I’m just crazy enough to want to try it. Well, I have a perfectly good length of mystery fiber fabric that I’d bought at Michael Levine’s Loft, located spang in the middle of the Los Angeles Garment District. The Loft, itself, is worthy of a whole post on its own, but what they sell there are the end pieces of bolts that the local manufacturers can’t use – and they sell it for $2.50 a pound. 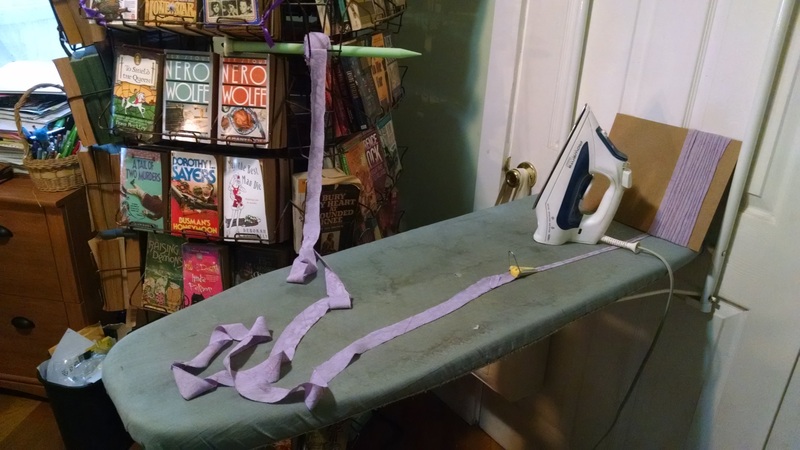 So I’d gotten this lovely cotton and something lavender fabric with a nifty design woven in and I thought it would be perfect for my draping experiment, especially since I’d gotten it for dirt cheap. The instruction call out several yards of ribbon, but I couldn’t find one that worked well with the fabric – and I have several pieces of purple and mauve ribbons to prove it. So I’m trying to figure out what to do and at the same time, was wondering what to use to test out my bias tape maker and bing, bing, bing! I can make bias tape from the fabric I want to drape with. So I did. The bias tape maker (giz-watchy) is only part of the process. You have to make the bias strips, first, which is actually pretty easy if you have a pre-made pattern piece – some outfits ask you to make your own bias binding. I have a couple patterns with the piece, but they’re buried somewhere in all my patterns. I found this tutorial from Dread Pirate Roberts (obviously a Princess Bride fan), which made things even easier. What you do is you layout a block on the fabric’s bias. Almost all fabric is woven with the threads crossing each other at 90-degree angles. So the straight grain is parallel to the length-wise threads, crosswise is parallel to the width-wise threads, and bias is the 45-degree angle that bisects those 90-degree intersections. 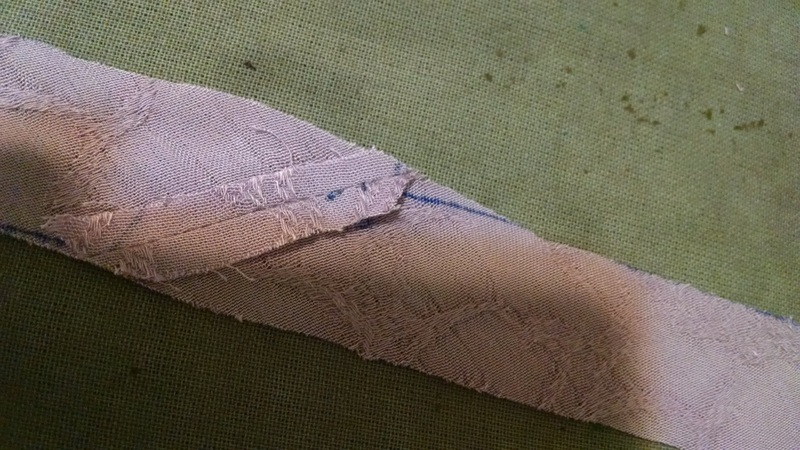 You sew two ends of that bias block together, with the ends staggered, so that you can cut along the long edge of the tube you just made in an ongoing loop that will turn into yards of bias stripping. Here’s the fun part. Once you’ve got your stripping made, you get your iron ready, and you poke your strip through the wide end of the bias tape maker, pull the fabric through the giz-watchy, which folds the long edges over, pressing it with the iron as you go. And then you have perfectly folded bias tape to attach to whatever you want. It’s not a lead-pipe cinch – I did have to fiddle with my first couple feet. The trick, I discovered, was keeping the iron as close to the nose of the giz-watchy as possible. The other trick was finding a way to spool my stripping so it didn’t get all tangled, as well as improvising a take-up reel for the finished tape. So I now have all this tape I can use instead of ribbon on my dress. When I get around to draping it. Eventually. Really.